Paraphalaenopsis is a genus just four species endemic to Borneo. 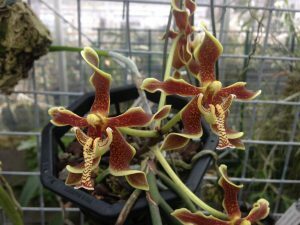 They are all warm growing with pendulous terete leaves and flowers which appear similar to Phalaenopsis – hence the name. Paraphalaenopsis labukensis comes from near the Labuk river where it grows as an epiphyte from 500 to 1000m altitude. The species has variable flower colour from yellow to dark brown and on first flowering we are really pleased with the colour of our flowers. The flowers also have a twist on the petals and sepals – we think that is probably to help advertise the flowers in all directions. The leaves are long and thin, so far only 80cm long but apparently over 2m when the plant is fully mature. A basket is great to accommodate the pendulous habit and the plant is well suited to conditions in our Warm Asia section. Note the lovely twist on the petals and sepals. I have kept the plant alive for years and finally have some blooms. It is mounted on a piece of wood with Sphagnum moss around the major part of the plant. The 4 full terete leaves hang down 28 inches with lots of roots on the wood + dangling, so I am at a loss of any other way to give this unique plant an optimum growth situation. My blooms are just as displayed above, there are five and are 2 inch’s each. 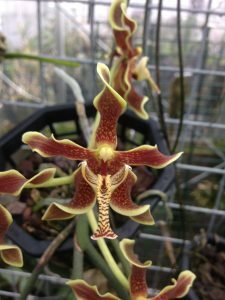 This plant is, in my estimation, a unique and fascinating orchid and I would like to give it a better home. I reside in SE Fla. I am glad to hear of your success with this wonderful species. We find that the species enjoys warmth and shade and we too have buds that will soon open. We have seedlings in our propagation lab too so hopefully we can help this plant to become more widely available.